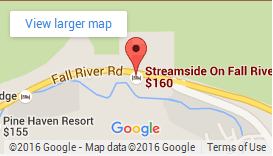 At Streamside, we are committed to providing a fun and relaxing environment for our guests. We continuously solicit feedback from our guests in order to determine what our guests value the most and where we may or may not have met our guest expectations. Based on the feedback we receive from our guests, we plan capital improvements for the upcoming year. Each year we do a mixture of routine maintenance projects and new guest enhancements. In 2015, we have remodeled the One Bedroom Suites, upgraded our WiFi system, and painted all buildings and decks. We’ve also added a 5% discount for all repeat guests! In addition to direct feedback we get from our guests during their stay, our primary methods for soliciting guest feedback are the Guest Survey, which is sent to all guests at check out, and TripAdvisor.com. TripAdvisor is an online hotel review website. We monitor our listing and encourage all guest to post reviews on TripAdvisor so that other prospective guests have a great resource to help them choose whether to stay at Streamside.